Today I will be listening to my new WEBCRUSH. I’m downloading Preslav Literary School’s album Pretext/Context right now, and I think it’s going to sound marvelous in headphones later. I see on the site references to musique concrete, Basinski, and reconstruct/deconstruct. All informative descriptions. The broadest, simplest idea I would tag it with is “accessible experimental”. The accessibility stems from the human hand recognizable as author of the work, and the very earthly soundscapes created. Preview the work here. Preslav Literary School is Adam Thomas, whose work you may have encountered at various European festivals, where he performs live tape collage. Or you may have encountered his taste in the work of others if you enjoyed transmediale.10, as he was involved with its curation. His website, in addition to hosting recordings, contains creative writing both journalistic and fictional. I read without surprise that he was reading Gravity’s Rainbow in 2009, and of course I wondered if he completed it (observant readers of Even More Legendary may recall my confession that I have repeatedly failed to do so). The site also reports on projects he’s involved in, like the Berlin Tape Run, whereby a tape changes hands repeatedly over four months, resulting in a collaborative audio document; and Echolalia, featuring a live tape orchestra, a workshop, and a publication of speculative fiction. Lucky number 7, for an Olympic winter, now available. Well, I finally finished it. A friend who is an avid reader, and more to my point, a socially avid reader, in that she participates in a book group, tells me that she knows a number of people who have not finished it. A number of people. She had told me this before I finished, but I don’t think it spurred me on. Although I do carry some baggage around my multiple failed attempts to finish Gravity’s Rainbow. I thought I would feel relieved when I finished. Not just because I had been finding it hard to stick with, but also because I was out of renewals at the library and was reading it on ever more costly overdues. I didn’t feel relieved. I felt disappointed, at first, and actually I felt an expected disappointment. 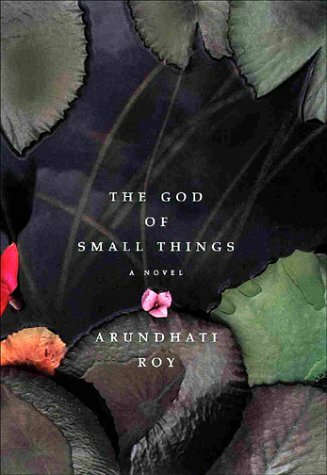 There had come a point in my reading The God of Small Things when I started expecting ultimate disappointment. I lost faith. But then, having finished, I read the laconic author bio on the back sleeve, and “first book” restored my faith. After all, I had enjoyed beautifully conjured settings, lush atmospheres, and an important social commentary. I suspect it will be memorable. My disappointment was only with a payoff that did not match its buildup. (Nor would I want it to. The payoff was fine. It needed less buildup.) A structural thing, really, and that reminds me of the kind of chop that gets honed with practice. I hope Arundhati Roy will write a second book. Mostly lists, not many reviews yet, but you might consider that a blessing.